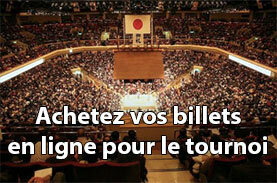 Accueil » Tournois » Tournoi de septembre : Aki basho » J11 – Gôeidô conforte son leadership ! L’Ozeki Gôeidô a conforté sa place de leader en l’emportant sur le sekiwake Mitakeumi ce mercredi. Avec la troisième défaite de Chiyotairyû, Gôeidô a pris un avantage décisif dans ce tournoi automnal en éconduisant Mitakeumi des deux mains en dehors du cercle. Les pronostics consistants à le voir vainqueur se confirment. Tamawashi (5-6) a triomphé de Chiyotairyu qu’il a « empaqueté » hors du ring. Chiyotairyu partage la deuxième place avec Asanoyama et Takanoiwa à 8-3. Quels résultats pour ceux qui étaient en tête en début de tournoi ? Le maegashira n°3 Onosho (7-4), n’a pu que reculer face à l’impressionnante poussée continue de Tochiozan (4-7). Daishomaru (maegashira n°12) a été amené au sol par une gifle du maegashira n°9, Takanoiwa (8-3). 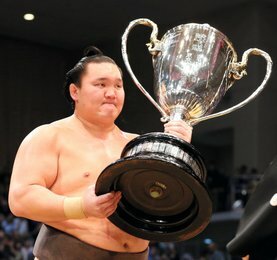 Le yokozuna Harumafuji (7-4) à fait une belle démonstration de la technique circulaire « uwatedashinage » au désavantage de Ichinojo (6-5). 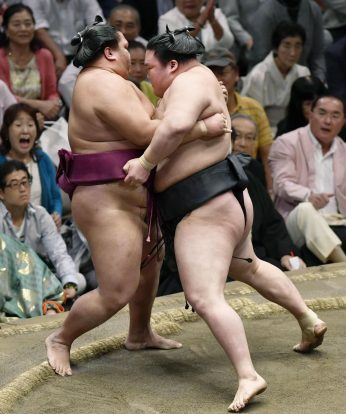 Ozeki Goeido capitalized on a slip-up by his closest rival to move two wins clear at the Autumn Grand Sumo Tournament on Wednesday. 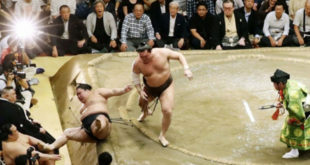 After Chiyotairyu crashed to a third defeat, Goeido (10-1) took full advantage in the day’s penultimate bout, getting both hands on the front of Mitakeumi’s (5-6) belt and surging forward to force him over the straw bales. Goeido, who won his first career title with a 15-0 mark at this tournament last year, looks like a good bet to take home the championship hardware in the absence of a number of top wrestlers. 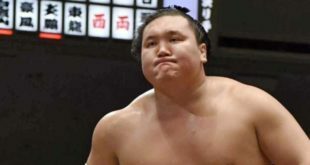 The field has been weakened following the withdrawal of three yokozuna, Hakuho, Kakuryu and Kisenosato, and two ozeki, Takayasu and Terunofuji. 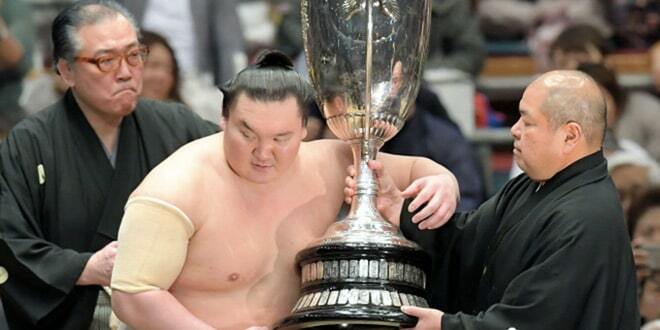 Komusubi Tamawashi (5-6) outgrappled Chiyotairyu and bundled the third-ranked maegashira out of the ring. Chiyotairyu shares second place with Asanoyama and Takanoiwa at 8-3. Asanoyama, a No. 16 maegashira, kicked off the day’s action in the top flight by shoving out 13th-ranked Kaisei (6-5), securing a majority of wins in his debut in the makuuchi division in the process. Ninth-ranked Takanoiwa slapped down 12th-ranked Daishomaru (7-4), but ninth-ranked Mongolian maegashira Arawashi fell a further win off the pace, dropping to 7-4 after getting forced out by 14th-ranked Endo (7-4). 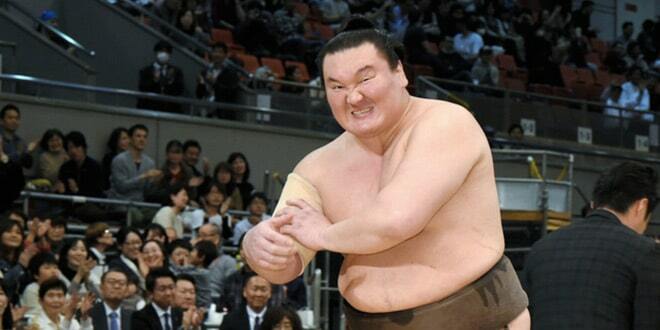 In the day’s finale, lone yokozuna Harumafuji (7-4) took out sixth-ranked maegashira and fellow Mongolian Ichinojo (6-5) with pulling overarm throw.